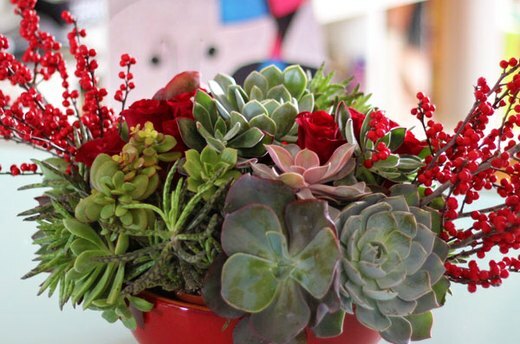 Rich in color and texture, succulents add stylish impact to holiday centerpieces. Besides their beauty, one of the biggest advantages of succulents is that they are so hearty, and will stay looking fresh throughout the season. In fact, when you are through with the centerpiece, you can even replant the individual blooms. 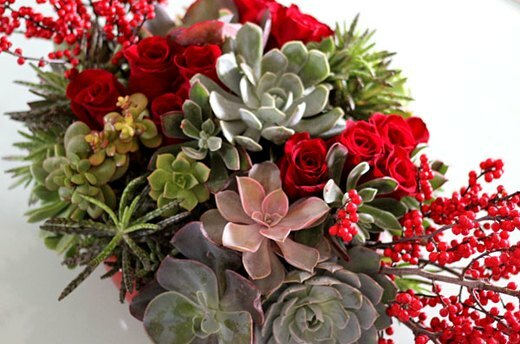 Accented with red roses and berries, this succulent centerpiece will be the crowning touch of your holiday table. 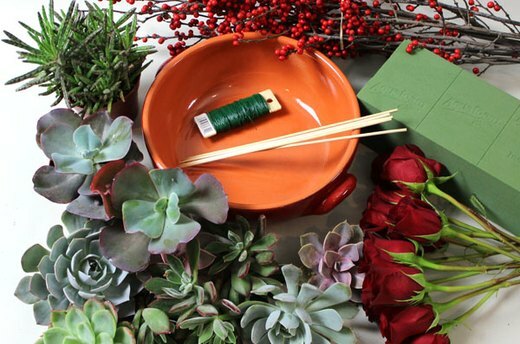 To create this centerpiece, you will need a medium-sized bowl, a variety of freshly cut succulents, red roses, holiday berry branches, floral foam, wooden skewers and florist wire. For visual interest, select succulent blooms that are of different sizes and colors. If you do not have succulents in your yard, succulent plants are readily available at nurseries, supermarkets, or even dollar stores. 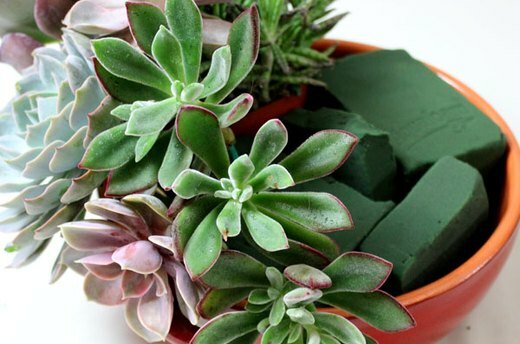 If you purchased your succulents at a store, lift the plants from their plastic containers and remove the dirt and roots. Keep as much of the stems in tact as possible, since you will be needing them to insert into the arrangement. 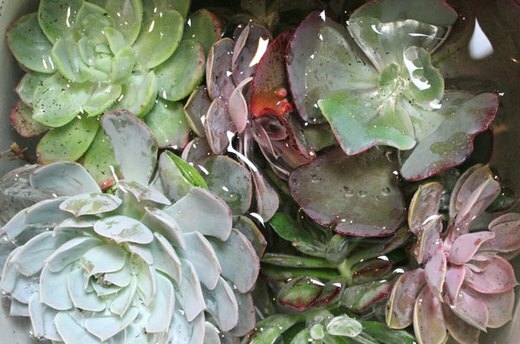 Peel off dried leaves and loose petals from the cuttings, and then soak the succulents in a bucket of water to remove dirt and kill any bugs. This step also hydrates the blooms before they are placed in the centerpiece. 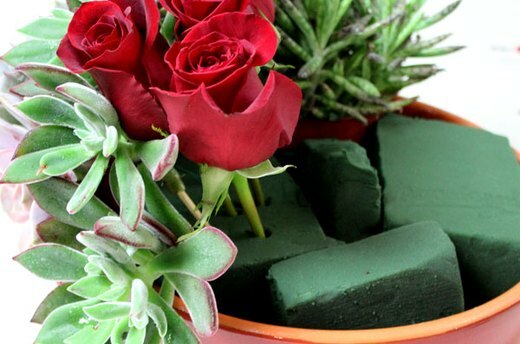 Cut the floral foam in pieces that will fit into your centerpiece bowl, and immerse the floral foam pieces in water. Floral foam is available in the floral supply section of your local crafts store. Be sure to buy the floral foam designated for fresh flowers rather than the kind made for silk flowers. The larger succulent blooms are top heavy, and the stems are most likely not long enough to insert into the arrangement. 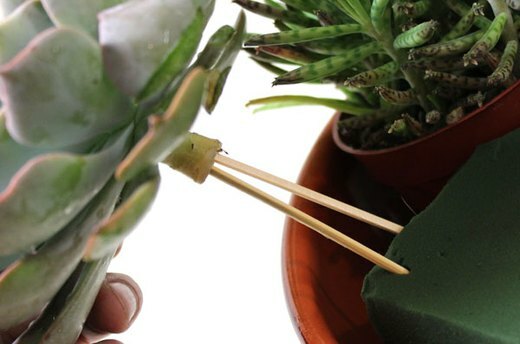 Make a fresh cut in the stem and insert two wooden skewers in it. The skewers artificially lengthen the stem, and having two of them provides more stability. 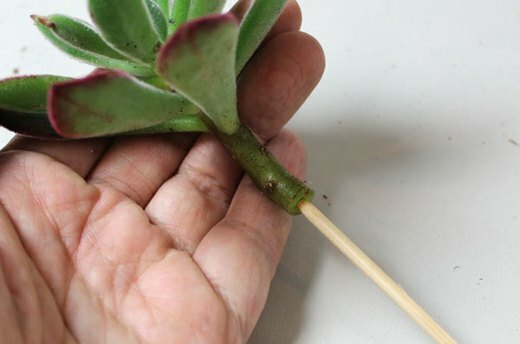 For succulents with narrower stems, there is only room to insert one skewer. Stability is not an issue with these smaller blooms because they are not top-heavy, so one skewer is usually enough. 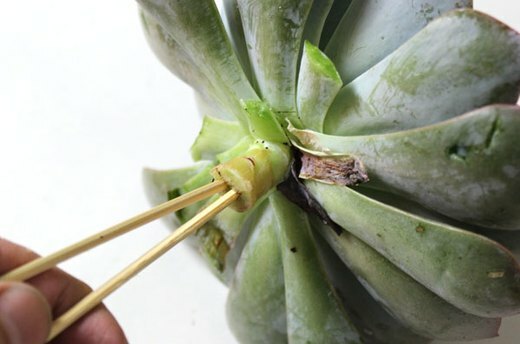 Be careful when inserting the skewer that you do not tear through the stem and poke your fingers. Tiny blooms that are less than three inches in diameter are great for filling out holes in the centerpiece. However, these blooms do not have thick enough stems for skewers. 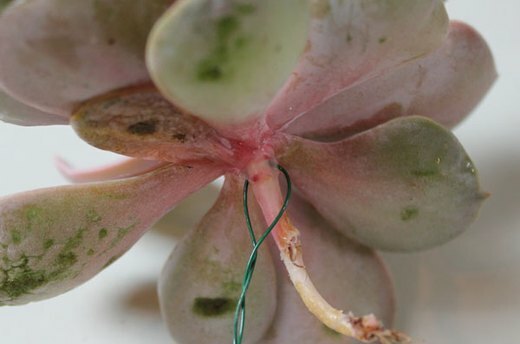 Instead, insert some floral wire at the base of the succulent and twist the two ends of the wire together to form an extension that can be inserted into the arrangement. Floral wire can be found at the crafts store, next to the floral foam. 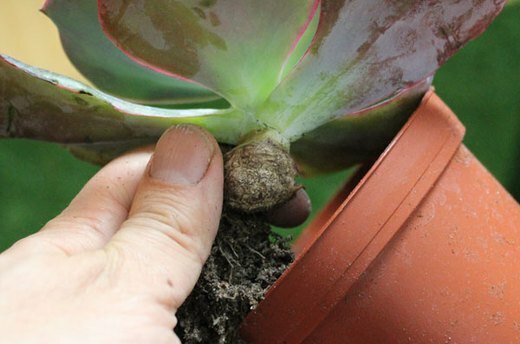 Succulents that are more skeletal rather than flowery in appearance are very delicate and will fall apart when removed from their original containers. 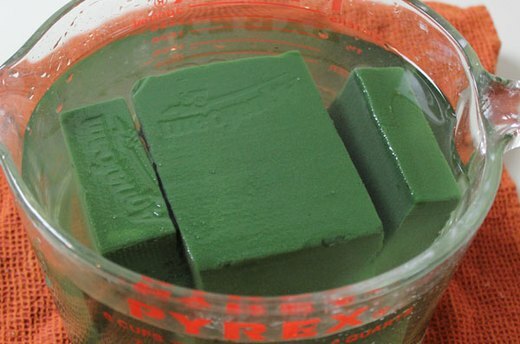 It is easier to keep them in their pots, tucking them in between pieces of floral foam. Starting at the bottom by the rim of the bowl, arrange the blooms by inserting the skewers or wires into the floral foam. If the skewers are too long to fit in the bowl, just cut them. 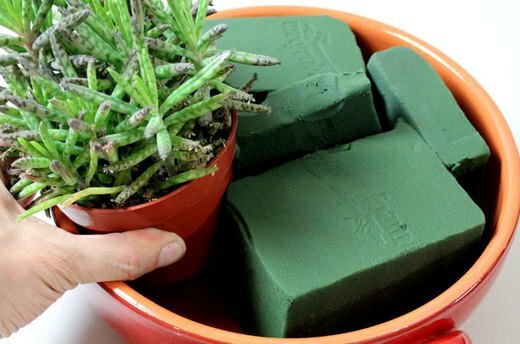 In many cases, the actual stem of the succulents will not touch the floral foam. This is fine, as succulents will last for a long time out of water. Continue adding succulents to the arrangement. To achieve a domed effect, the blooms should be inserted into the foam at a gradual angle, so the bottom blooms face the side while the top blooms face upward. 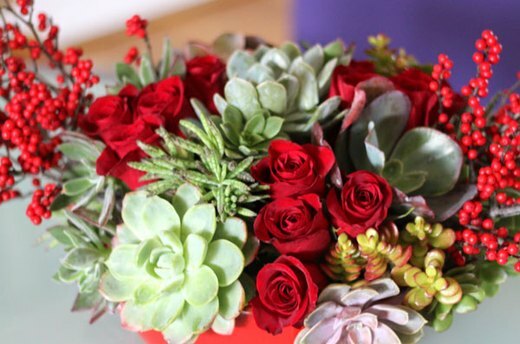 After you've placed a few succulents in the arrangement, cut the rose stems and insert them next to the succulent blooms. Instead of scattering individual roses throughout the centerpiece, group the roses in clusters for higher visual impact. Then continue filling the centerpiece with additional succulents and roses until all the floral foam is covered. 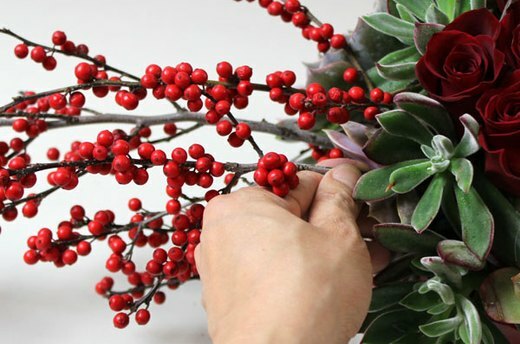 Slide branches of holiday berries into one side of the arrangement, pushing them into the floral foam. Pictured are ilex branches, but you can also use holly, which is related to the ilex, magnolia leaves or even pine branches. See what you have handy in your own yard. Balance the arrangement by inserting berry branches on the opposite side. While the centerpiece already looked beautiful without the branches, the berries add a brilliant pop of color, and the horizontal nature of the arrangement makes it ideal for rectangular dining tables, buffets or mantels. Turn the centerpiece around to see it from every side, as you want it to look beautiful from every angle. You may have to adjust the placement of some of the blooms if any part looks lop-sided. It's a good idea to keep a few small blooms at hand to fill up any obvious holes. 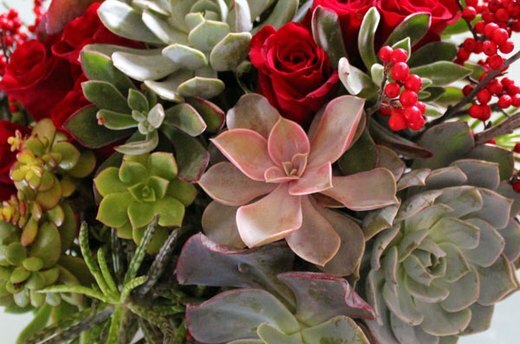 Succulent centerpieces last much longer than traditional arrangements because the cut blooms are so hearty. When the roses begin to die, just remove them and insert other flowers. The surrounding succulents will continue to look fresh. When the season is over, you can place the succulents back in the soil where they will reroot and propagate – so you will have more succulents for next year's centerpiece.